It's a familiar chain of events: A prominent scholar and public intellectual visits an elite college campus to speak to students. In his remarks, he shocks his audience and the Jewish community by questioning the right of the Jewish people to a state, and asserting that the Zionist treatment of the Palestinians is morally equivalent to the Nazi treatment of the Jews. Naturally, the address elicits strong condemnation from the local Israeli ambassador. But this is 1961, not 2014. 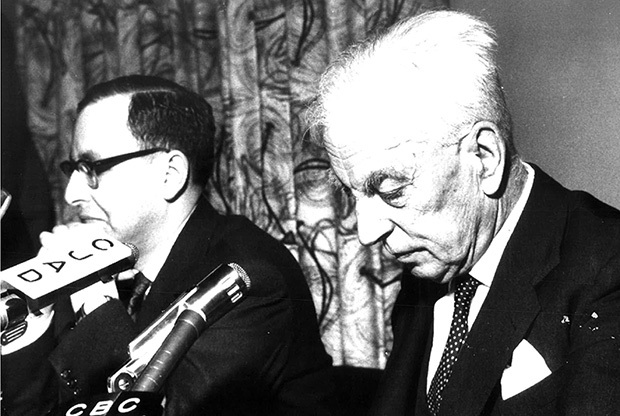 The setting is Montreal, where the famed British historian Arnold Toynbee, a specialist in international affairs, delivered a controversial lecture to students at McGill University. And the story didn't end with an exchange of op-eds, press releases, and public apologies. Instead, Israel's ambassador to Canada, Yaacov Herzog, responded by challenging Toynbee to a public debate, just five days after his initial comments. On Jan. 31—53 years ago today—the two squared off at McGill's Hillel House for an exchange that was broadcast live across the country and later that evening in Israel. Shimon Peres has called the ensuing disputation "one of the most dramatic debates in the history of our people." Last week, in welcoming Canadian Prime Minister Stephen Harper to Israel, Herzog's nephew Labor Party leader Isaac Herzog, cited the event from the Knesset podium. Yet as the years pass, fewer and fewer have even heard of it. On its anniversary, the debate between the scholar and the diplomat is worth revisiting, not only because its terms remain fresh, but because it offers a way of talking about Israel that has largely been lost. The McGill talk wasn't the first time Toynbee, a professor at the London School of Economics, had equated the Jews and their Nazi oppressors. He had actually written as much in 1954 in the eighth volume of his acclaimed Oxford University Press Study of History series. But while few laymen had read that book, Toynbee's comments at McGill quickly reverberated through the press and local Jewish community. The 71-year-old scholar was no stranger to controversy involving Jews—he had infamously labeled the Jewish people a "fossilized" civilization and "extinct society" in 1934 and later described Zionism as "demonic." The historian also had an unfortunate record with the Nazis: After meeting with Adolf Hitler in 1936, Toynbee told the British Foreign Office that he believed the German leader was "sincere" in disclaiming any desire to conquer Europe. Though this checkered past led some to accuse Toynbee of anti-Semitism, it did little to temper his celebrity, which is how he found himself invited across the Atlantic to lecture at McGill. But for Herzog, Toynbee's comments on campus stepped over the line. Without consulting with his superiors, the Israeli ambassador immediately challenged Toynbee to a public debate on both his Nazi analogy and his assertion that Judaism was a "fossil." At 39, Herzog was two generations younger than the historian, but he was no intellectual lightweight: The son of Israel's second Ashkenazi Chief Rabbi Isaac Halevi Herzog and brother of its future president Chaim Herzog, Yaacov Herzog was both an accomplished religious scholar and a singularly adept diplomat. He would later serve as the director-general of the prime minister's office under Levi Eshkol and Golda Meir, after turning down the chief rabbinate of Britain. And so, on the evening of Jan. 31, the young ambassador stood before an overflow crowd at the McGill Hillel House, surrounded by press and microphones from numerous radio stations. "First let me clarify that I am here in my personal, and not in my official capacity," Herzog opened. "Indeed, over the past 48 hours since Professor Toynbee agreed to this debate, I have done very little in the nature of my official capacity and have been more or less traversing beyond space and time a few thousand years of history, back and forth, trying to disentangle civilizations and fossils." With these words, Herzog tacitly acknowledged that both local Canadian Jewish leaders as well as some Israeli Foreign Ministry officials had disapproved of his challenge to Toynbee, fearing the relatively unknown diplomat would be overmatched by a famous intellectual nearly twice his age. As Herzog's biographer Michael Bar-Zohar wrote, "At that moment, he was not a civil servant and government official, but an unofficial spokesman of the Jewish people, fighting for its honor." Toynbee's opening statement was emblematic of the charm for which the avuncular historian was well known. "Boxers shake hands before they fight," he said. "Perhaps that is rather a good example for ambassadors and professors. I am afraid we shan't give such an entertaining performance as boxers might do, but still, this is a very important and serious occasion." With that, battle was joined. The hour-and-20-minute sparring match ranged over Jewish history, Arab history, and human history, tackling everything from the Palestinian refugee problem to the minutiae of international law. Each debater scored points off the other, but on the key contentions on which the dispute had been predicated—whether Israel's actions in 1948 were morally equivalent to the Nazis, and whether the Jewish nation was a fossilized civilization—Herzog emerged the clear victor. From the start, Herzog pressed Toynbee to explain how, exactly, Israel's actions during a war of self-defense against multiple Arab armies could be compared to the Nazis' systematic genocidal program against the Jews. Toynbee explained that he did not intend to statistically equate the actions of the Nazis with those of Israel's founders, but rather simply to draw a moral comparison: that individual massacres committed by Israeli forces in 1948 were no different than those perpetrated by the Germans against the Jews. "If I murder one man, that makes me a murderer," he observed. "I don't have to reach the thousand mark or the million mark to be a murderer." Herzog pounced on this point, turning Toynbee's own scholarship against him. "Now, Professor, in volume four, page 128F, of your Study of History you say, 'In the history of man's attempt at civilization hitherto, there has never been any society whose progress and civilization has gone so far that in times of revolution or war, its members could be relied upon not to commit atrocities,' " Herzog recited. He then listed all the nations Toynbee himself implicated in this charge: the Germans in Belgium in 1914, the British in Ireland in 1920, the French in Syria, and many others throughout history—including, of course, the Nazis. Herzog then added one group that Toynbee had omitted: "Do you agree that there were also Arab massacres of Jewish civilians?" Herzog made reference to such cases, asking, "Were these also in the category of Nazi atrocities? And if so, why don't you say that both sides did things in such a category? Why do you choose us? Why do you single us out? Why don't you write of Britain and of almost every country in the world according to your own definition?" After several minutes of such questioning, Toynbee conceded the point. "I agree that most societies have committed atrocities, but I do not think that condones atrocities," he said. "I agree with you on that," Herzog quickly responded. "But do you agree that this comparison can be applied on the universal level to any country which in war its soldiers have committed atrocities against civilians?" Toynbee had to concur: "Yes, atrocities are atrocities and murder is murder, whoever commits it." Herzog asked if Toynbee would similarly stigmatize "Arab atrocities against Jewish civilian populations," and those committed by the United States. "Of course," the professor replied. With that admission, Herzog essentially disarmed the historian. After all, if every nation had behaved like the Nazis, then the charge was divested of moral meaning. "In other words," Herzog concluded, "the Nazi pall lies across the world, before the Nazis came ... and after they have gone." Jews, then, were no more prone to immoral conduct than any other people, and Israel no more and no less guilty than any other modern state. The debate turned to the question of whether the Jewish people were indeed a "fossil"—an outmoded remnant of a bygone era—or rather a living, breathing civilization in their own right. Was the establishment of Israel an anachronism or an achievement? On this question, Herzog managed to extract another concession from Toynbee, when the historian acknowledged that "Israel can defossilize, just as you can defrost a car." While Toynbee continued to insist that due to persecution and isolation, Jews had not played an influential role in much of modern history, he allowed that "the Jews in present times have ... become part of the general stream of life and have played this enormous part in it." Herzog closed by inviting Toynbee to visit Israel and witness its "defossilization" firsthand. By the end of the engagement, it was clear the young ambassador had bested the elder historian. Toynbee's wife Veronica was overheard telling him afterward, "I told you not to take part in this debate!" The leading Canadian dailies commended Herzog's performance, and congratulatory telegrams poured in to the Israeli embassy in Ottawa. The event also proved an inspiration for many Jewish students in attendance. One such student was 20-year-old Irwin Cotler, who went on to become a professor of law at McGill, specializing in human rights, and a member of Canada's parliament, serving as justice minister from 2003 to 2006. "If the Jewish students had felt humiliated by Toynbee's lecture, now they felt pride and self-respect as Jews," he told Herzog's biographer. "What Herzog did had psychological no less than intellectual impact." And yet, the Herzog-Toynbee debate has largely faded from the public memory, perhaps because its participants have. Toynbee's scholarly reputation, which rested on his magisterial multivolume Study of History, did not age well, as the essentialist nature of his historical analysis fell out of favor. And though Herzog went on to serve multiple Israeli prime ministers, he died young in 1972, at the age of 50. But their debate is worthy of remembrance, not merely in the simplistic sense of who won, but as a way of thinking about Israel that has sadly fallen by the wayside. Today, the understanding of the Jewish state that Herzog conveyed—a normal state with normal problems—is almost entirely absent from the public discourse. For many of its supporters, Israel must be defended absolutely as an unassailable island of moral rectitude, an exception to the rule of human error and imperfection. It never commits war crimes, and it seldom makes mistakes. Israel's critics, by contrast, often imagine the Jewish state as heir to the Third Reich and a uniquely evil blight on the face of the Middle East. There is no depravity to which this "Zionazi" regime will not stoop, and no crime too lurid for it to commit. In other words, Israel is either superhuman or subhuman. But when called upon to defend Israel from the charge of Nazi-like conduct, Herzog took a very different approach. He did not deny that Israeli forces had committed crimes in 1948. He contextualized those crimes and pointed out that they were condemned by wider Israeli society, but he did not deny that they took place. He acknowledged Israel's fallibility, like that of any other nation. Vindication for Herzog rested not in clearing Israel of any wrongdoing, but in situating its failures in the context of human failure. By compelling Toynbee to concede that Israel's moral offenses were no different than those of any other country, he established that Israel's crime was not its inhumanity, but its humanity. Herzog's argument creates space for conversation about Israel, both appreciative and critical. The extremist caricatures it rejects, by contrast, create a self-sustaining bubble in which such dialogue cannot take place. Those who insist that the Jewish state is immaculately conceived and governed inevitably fuel the disillusionment that bolsters those who portray the Zionist project as demonic. And those who cast Israel as a regime governed by fascist criminals provoke the very defensiveness that leads others to defend Israel in all circumstances—even when it should not be defended. Within this context, it becomes almost impossible to have a normal conversation about Israel or its problems. The best way, then, to mark the 53rd anniversary of Herzog's successful showdown with Toynbee is to reclaim Herzog's Israel, with all its imperfections and promise. Because if we continue to treat the Jewish state as a fossil—something to be displayed pristinely on a shelf, or buried in the dustbin of history, rather than understood as a living, breathing, and sometimes flawed organism—Toynbee will have won after all.